A good shoe repair store can be a girl's (or boy's) best friend. We've all been there: you find the perfect pair of shoes, you wear them to death, and then disaster strikes. You lose a heel, the toes get scuffed, and your beautiful shoes are suddenly heading for a date with the dustman. You need shoe repair, and you need it quick! A good pair of shoes can be your friend for life--or for a few years, anyway. To make your shoes last, however, you'll need to maintain them. Heels and soles should be replaced regularly, broken straps should be repaired, and holes should be patched. Keep them clean. Never put your shoes away dirty. Always take a few minutes to brush off mud and other stains first. Keep them dry. If you've been wearing your shoes in wet weather, make sure you dry them out properly before you put them away. Wet shoes placed inside a cold closet will stay wet, but you won't know that until the next time you try to wear them. You don't need to go to a huge amount of trouble to dry your shoes, either: just leaving them in a warm room or near a radiator will be enough. Keep them polished. Polishing your shoes doesn't just make them shiny, it also allows you to check the shoes for nicks, scratches, and other problems which may need to be professionally repaired. Keep them waterproofed. If your shoes are leather and you'll be wearing them in wet weather, it's a good idea to use a waterproofing treatment to keep them supple and dry. This will also prevent water damage to your shoes. Catch problems as soon as they start. Don't wait until a small hole turns into a large one! Have your shoes repaired as soon as you start to notice problems. It'll be cheaper and easier for you in the long run. 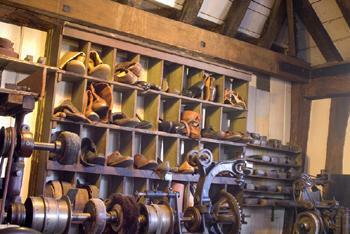 Certain types of shoes will need more repair than others. Dance shoes, for example, are in much heavier use than most other types of shoes. In the interests of safety, it's important that they be well-maintained. Athletic shoes, too, must be well-maintained if they are to be worn safely. Never risk wearing dance or athletic shoes that have loose soles or other problems; make sure they're properly repaired or buy a new pair instead! Shoes with high heels are particularly vulnerable to problems. Heel beds come loose and fall off. Stiletto heels get stuck down the cracks in the pavements, causing nicks and scratches in the leather. Not all shoe repairers are able to fix stilettos, so you may need to shop around for a shoe repair expert who can bring your high-heel shoes back to life!